As we head into the final few weeks of the year, 2017 has been a banner year for stocks not just in the U.S., but around the world. Investors have been focused on the upbeat fundamentals – corporate profit growth sparked by economic gains at home and abroad. The U.S. economy grew at 3.3% in Q3, according to revisions released by the U.S. BEA. It’s the second quarter in a row that GDP has exceeded 3%, a feat that hasn’t occurred in the three previous years. As Q3 concludes, S&P 500 earnings are up a solid 8.4% versus a year ago, according to Thomson Reuters. And analysts are forecasting a return to double-digit earnings growth in 2018. 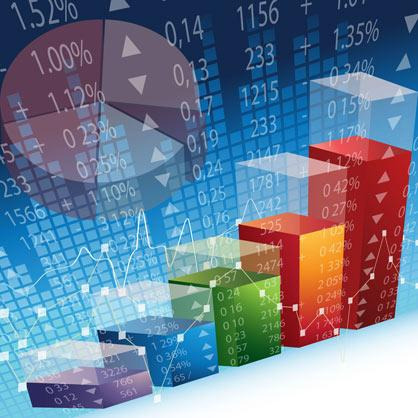 Strong gains in the market sometimes encourage investors to plow headfirst into stocks. Others wonder openly if it’s time to take profits and move to the sidelines. Let us take a brief moment to mention that market timing is a game best left to gamblers. 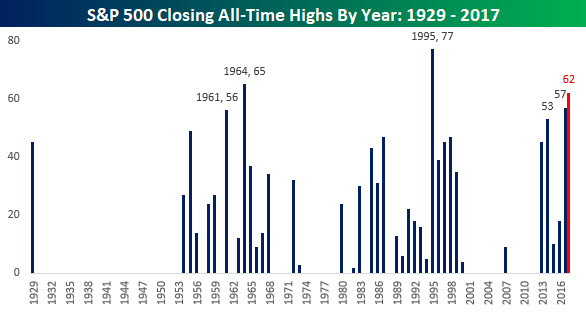 We’ve had almost 60 all-time closing highs in the S&P 500 Index this year (LPL Research, St. Louis Federal Reserve). That comes on top of a string of highs the market has recorded since 2013. As shown in the chart below, if the final weeks of 2017 keep pace with the previous eleven months of the year, 2017 would finish with a total of 62 all-time closing highs. A new high means one thing – stocks closed higher that day versus the prior day. By itself, it doesn’t foreshadow an imminent downturn as many bearish pundits have been suggesting. Nevertheless, if you are concerned and want to talk, we're simply a phone call away. We’d love to hear from you!